In what seemed like a natural progression from an early interest in both science fiction and physics, Jim passed through the gates of a PhD in Physics to a career in research and teaching physics, with occasional stops along the way to enjoy astrophysics and space travel. Unfortunately, the attempt to combine research and teaching with writing SF on the side turned out to be too tough. But having now served his time as a professional physicist, he’s happily writing SF as a hobby. Why do we want Faster Than Light (FTL) Space Travel? The real universe (or even just our galaxy) is a big place. The fastest spacecraft NASA is currently actively planning is the Solar Probe Plus, designed to launch in 2018 and approach the sun, with a maximum speed of about 200 kilometers per second. At that speed, we could go from the Earth to the Moon in about half an hour. Pretty fast, huh? Basically, there ‘ain’t no such thing’. Sorry. Specifically, most physicists and engineers would say that FTL is impossible if you believe modern physics. Einstein’s Special Theory of Relativity states that it would take infinite energy for a material object (like a spaceship!) to travel just at the speed of light. And that infinite doesn’t mean just lots and lots and lots of energy. It means literally more energy than exists in the finite universe. This means that the speed of light is the absolute speed limit in our reality. Another consequence of FTL in terms of special relativity is that it can lead to the breakdown of cause-and-effect. This is too complicated to really go into here, but basically special relativity says that every person (technically, frame of reference) moving with a different speed sees the universe differently, even down to the order in which things take place. In particular, if FTL occurs, there will be some people who ‘see’ the ship arrive before it’s left. Another way of looking at this is that any FTL device can also function as a time travel machine! But from the earliest days, science fiction has wanted to play out on the big stages, so all but the most hard-core SF purist is willing to bend the rules a bit for the sake of a good story involving galactic empires. 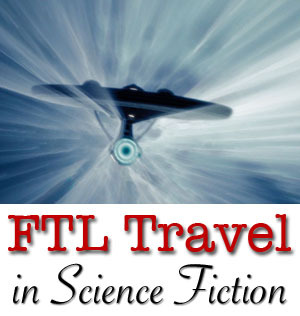 To that end science fiction has come up with a number of imagined methods for FTL, some with more scientific plausibility than others. If you want your story to sound scientific, you’ll need to face up to the problem of real interstellar distances, but be prepared to wave your hands a bit and mutter the accepted ‘magic words’ that show that you’re willing to play the game properly. There are many dozens of different names and ideas used for FTL technology in science fiction, but we’ll take a brief look at four main types. With the exception of the two of you giggling up there at the corner on the ceiling, everybody in sci-fi is familiar with Star Trek and its warp drive through the use of ‘dilithium crystals’. Depending on which generation you belong to, the special effects vary, but the basic idea is the same. You start up your warp drive and break through the light barrier, allowing you to have adventures all over the galaxy (and in some cases, even beyond). There’s usually no real scientific justification for this, but at least you’re facing up to the whole light-speed limit issue. This is now an accepted trope in SF, and you’re allowed to switch it on yourself in your stories, although calling it ‘warp drive’ may bring up images of Star Trek. If you want to spend a little more time waving your hands about and sounding more expert, you can name your own version of FTL drive, or simply mention the Alcubiere drive (this is an actual scientific idea, which was first developed in 1994, but has been revived more recently to the point where NASA scientists are actually looking at a variant – but still only in theory!). Hyperspace is an old idea in science fiction, encouraged by the fact that it’s a real mathematical concept. Although it sounds interesting, in mathematics hyperspace simply refers to a set of dimensions beyond the normal three spatial directions (left-right, forward-backward, up-down), so we can talk about a hypersphere or a hypercube in four (or more) dimensions. The key to FTL through hyperspace is the idea that different hyperspaces may have different intrinsic length scales. So while in our normal universe, Proxima Centauri is just over four light years away, we can imagine a more compact hyperspace in which the distance is much shorter – let’s be absurd and say 4 kilometers. So in that hyperspace, travelling to Proxima Centauri at the speed of a normal car would only take a few minutes. So if we can shift our ship into hyperspace, we can get there very quickly. Depending on the needs of your story, you can make the hyperspace journey shorter or longer by changing the size of your dimensions. There are examples in modern SF of having a range of hyperspaces with different scales, so that you can change your speed by moving up the hyperspace ladder. In older SF, this alternate space was sometimes called subspace, implying that it somehow lay beneath our normal three-dimensional world. The first type has hyperspace accessed through gates that are fixed at certain locations in the galaxy, often making their location an important political and strategic consideration. On TV, Babylon Five jump gates were of this sort, created by unknown advanced aliens sometime in the past. Another version allows individual large ships to enter and exit hyperspace directly with their own engines at any point in space. Again in Babylon Five, larger ships can have jump engines that allow for direct access to hyperspace, although it saves them energy if they can use a jump gate instead. Wormholes are usually described in terms of shortcuts across space by folding it. The key here is that if you take two points that are separated by, let’s say, five feet on a single very large sheet of paper, you can bring them closer together by folding or bending the sheet of paper until the two points are almost touching. So if a fast snail who can manage 3 feet per hour needs to travel from point A to point B, it will take him (or her) about an hour and forty minutes crawling along the paper. But if you helpfully fold the paper so that A is on the top and B is on the bottom as the paper touches itself, then the snail can simply hop across, bypassing all that real space and taking only a minute or two. In many cases, the wormholes are imagined to be naturally occurring, a result of some sort of natural folding of our universe. This is the sort used, for example, in David Weber’s Honor Harrington series, or the recent film Interstellar. Another version has the wormholes being engineered and fixed in space (a bit like the jump gates in Babylon Five); this fits in with the artificial gates of Stargate. Wormholes have a bit of scientific plausibility in that they are mathematically allowed by Einstein’s general theory of relativity. One classic version in physics is known as the Einstein-Rosen Bridge. Unfortunately, we don’t know how to actually create them yet. Another version of FTL is simply called the jump or hyper jump. Here you simply fire up your jump engine and are transferred instantaneously to somewhere else. This often includes ideas about the energy required for your jump drive going up as the mass of your ship and the distance jumped increases. This form of FTL is used in the ‘reimagined’ latest version of Battlestar Galactica. 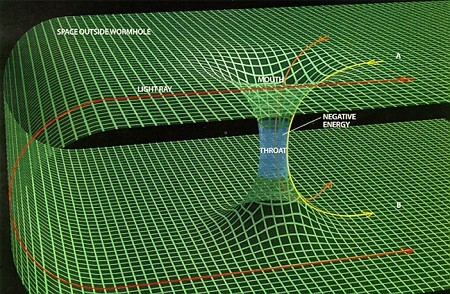 If you want to add some plausibility, you could describe a possible mechanism behind this such as the creation of a very short wormhole that connects the two points in space for an instant. Using FTL in science fiction isn’t really that difficult. Unless you want to make the nature of the FTL a fundamental part of your story, you simply have to make sure to use the right techno-jargon in the right way. The only exception to this is if you want to bring in the fact that FTL leads to the possibility of cause-and-effect breaking down and time travel. Then you’ll need to make more of an effort to explain the situation. Other than it being a common trope there is little reason for most science fiction to actually have faster than light travel. There is plenty of room in the solar system for huge empires, deviant human strains (which eliminates the need for horribly unrealistic human-like aliens, since they can just be humans! ), massive objects and huge spaceships. 99% of all science fiction, including space opera, could be rewritten to take place within the solar system and lose nothing except stuff that normies think is’ cool’. There is, but there’s no place in the solar system that unmodified humans could live without becoming troglodytes. Literally. There is the possibility of terraforming Mars, which is in a lot of stories I write. The time scale would be centuries, but it’s less a violation of the Standard Model to compress the time scale than to travel to Betelgeuse and back.